This week the online casino BGO are giving their players a chance to win fantastic prizes together with lots of free spins. You can win everything from a Digital Camera to a 55” Curved OLED LG TV worth no less than £5000. On top of this all players that qualify for the campaign will get rewarded with a minimum of 10 free spins! To take part in this campaign you just have to deposit at least £10 per day during the campaign period which is between the 4th and 10th of August. The deposited money should be wagered on BGO's own slot Aladdin. When you play on Aladdin you will also help building up the total winnins paid out! The more you wager the better prizes you have the chans to win! 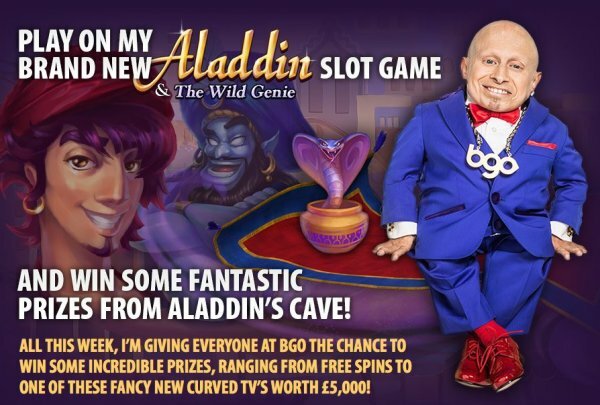 When you meet the minimum wagering target BGO will pay out your free spins which of course will be valid for you on the Aladdin slot. The prizes you can win in this campaign are a digital camera, an iPad Mini, a 50" Plasma TV, an Apple Macbook Pro and a weekend supercar hire. And last but not least one lucky player will win the curved TV! So what are you waiting for, get into the action right away! Get your prizes at BGO! Not only can players win amazing prizes at BGO. BGO is also really generous towards new players. When you sign up at BGO you will get 10 free spins with no deposit required. These free spins will be available for you immediately after sign up and can be used on the popular NetEnt slot Starburst. If you want more free rounds this is totally possible. Just make a first deposit to BGO and you will get additional 180 free spins. These spins can also be used on Starburst and will be giving away during nine days where you will get 20 free rounds a day. This makes the spins last longer and you can spread the fun out for over a week! These free rounds is not the only thing you will get as a depositing players. BGO will also give you a casino bonus of 200% up to £200. As a player you also have the chance to get daily free spins in Beat the Boss which is BGO's loyalty program. The Boss to Beat at BGO is no one else then the well known Verne Troyer mostly famous for being Mini Me in the Austin Power movies!